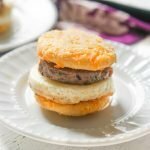 These low carb sausage & egg muffins use grain free muffins for a delicious breakfast on the go. Mix all ingredients except sausage and eggs and chill for 20 minutes. Divide dough and make muffins about the size of the sausage patties. Assemble your sandwiches with two muffins, 1 sausage and 1 fried egg. Eat immediately or store in the refrigerator or freeze. Recipe yields 14 muffins and if you use 2 muffins per sandwich, 7 sandwiches. I think 1 muffin is enough for my tastes so you can get more sandwiches out of this recipe if you feel the same.